Toolstop is an online power tools, hand tools and trade product retailer that started retailing in 1965 and online trading in 2007. Toolstop deals with only the top brands and holds everything in stock. Toolstop offers only quality branded products from manufacturers such as Makita, Dewalt, Bosch, Hitachi, Panasonic, Stanley, Bahco and Irwin. 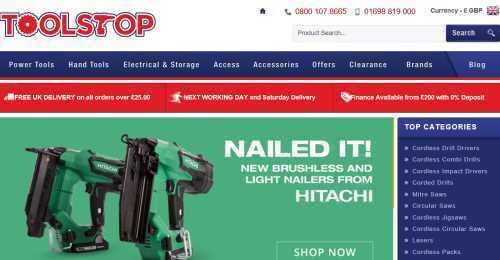 Professional trade users as well as keen DIY enthusiasts will find a massive range of tools and accessories for every application on the Toolstop website. Special Offers at Toolstop - Prices from £8.00! Check out the Special Offers for Power Tools and other tools at Toolshop. Verified this month. Valid until further notice. Toolstop discount code not required. Verified this month. Valid until further notice. Toolstop discount code not required.